Founded in Groningen is now open for everybody. Founded in Groningen is finally open for everyone to add content and ideas. You can add your own company and publish your own (company) blog posts. Besides that, you can also add events and find workspaces or other supporting initiatives. Join us and get started. Last weekend was all about shaping solutions for pressing issues and showing possibilities of A.I. and Blockchain. For at least 20 out of the 100 teams competing in the Odyssey Hackathon, the real work has just started. On Monday, Odyssey Ignite kicked-off the decentralized incubation program of the 20 winning teams, together with a fully supportive ecosystem and four super accelerators. The third edition of the biggest Blockchain and A.I. hackathon is just around the corner. A whopping 100 teams will be building prototypes this weekend, to address 20 complex challenges, with 1,500 people expected to attend the hackathon. City Council Member and Java consultant Terence van Zoelen is a real veteran, having competed in all three editions. So what’s it like to compete? And what will he be working on this year? The Odyssey Hackathon, previously known as the Dutch Blockchain Hackathon and Blockchaingers, will take place from April 11 to 15 and will see some of the brightest developers, creatives, and entrepreneurs from all over the world descend on Groningen, the Netherlands, to build collaborative solutions for global issues. 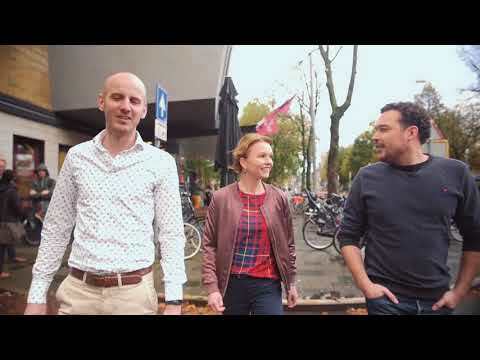 Groningen based marketing agency Tommorowmen recently launched a new startup, focussing solely on marketing activities through e-commerce giant Amazon. The startup, called AMAZIN, is one of the first companies in the Netherlands to do so. Chordify is going to release a new technology that enables guitars to play on their own. The Chordify algorithm is now training to be able to play music fully automatically. This way, live music is going to be available for everyone and it is a great solution for anyone who doesn’t have the time to practice for hours. The release of Guitarmation AI is scheduled for the end of the year. In the meantime, sign up as a beta tester and stay tuned. It’s International Women’s Day, so high time to put a few bossbabes from Groningen in the spotlight! We’ve gotten tons of suggestions, so this list is by no means complete. If you feel like someone definitely deserves a spot, let us know. In the meantime, here are 8 successful female entrepreneurs based in Groningen. Startup in Residence is now live!